Computers took their first baby steps towards “Artificial Intelligence (AI )” when we started using them to implement simple diagnostic systems. The earliest such systems were effectively a top-down design; usually built by simply encoding or storing “expert” knowledge in a large database. To a certain extent it could be argued that for the last 400 years we have been living in a time dominated by the concept of “deterministic cause and effect”. We believe in “rules of behavior”; we believe in the concept that clearly defined clauses will always have a clearly defined effect. Mathematical Physics is the ultimate science of such deterministic cause and effect. Physics prides itself on being the science that identifies “mathematical rules” of behavior that link cause to effect. In reality however physics is really just the science of simple systems (systems without the friction of feedback), because, unlike simple systems, the behavior of complex systems (systems with feedback) do not obey clearly defined mathematical rules. So to tackle complex problems, and the behavior of complex systems, many computer scientists are beginning to turn away from rule based systems (build from the top down) and instead are focusing their efforts on “Artificial Expertise” (generated from the bottom up). The basic idea that drives this artificial intuition is that machine knowledge is built, not by encoding linear rules of cause and effect but, by evolving a deep neural network to accumulation, and generate, nonlinear “Emergent Expertise”. We all know that to become a true expert at anything requires a lot of practice — learning the rules just doesn’t cut it. True expertise requires practice because expertise always emerges from the bottom up. Over the last number of years we have witnessed the rise in the concept of so-called “Big Data”. Big data is considered to be something of a game changer; but, in truth, most of the time the people who are using the term are really just writing reports. Big whoop! Very cutting edge!.. 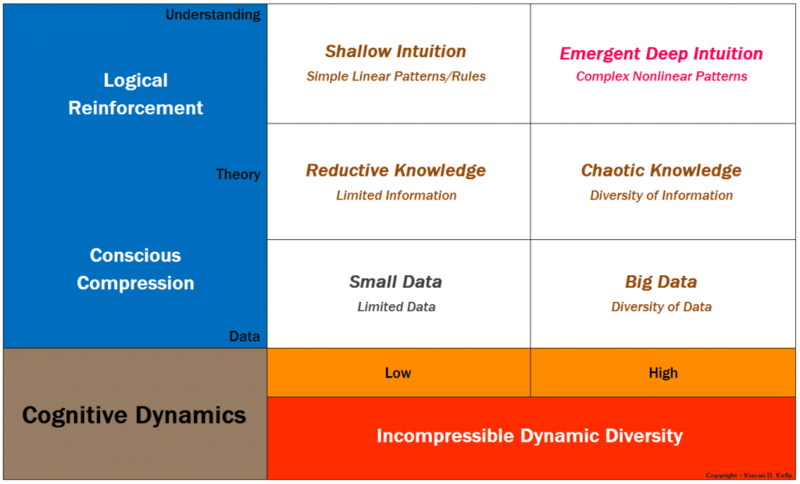 In the past there were really just two things that were holding back true AI; and they were, the sheer computing power required for processing a bottom-up methodology, and, the diversity of data required to feed such a methodology. However the recent explosion of big data means that we now have lots of “training data” to feed our deep neural networks. This means that we now have lots of diverse actions and feedback that we can use to generate the digital equivalent of Malcolm Gladwell’s 10,000 hours of practice. But the thing about digital practice hours is that our digital friends are not operating in the same fixed time environment as us. With the right amount of data AI systems should be able build deep knowledge and expertise on just about anything (really really fast)…. And so as we move further and further away from rule-based systems to emergent-expert systems we are also moving closer and closer to a form of “Artificial Generalized Intelligence (AGI)”. AGI has been the stuff of science fiction novels and Hollywood movies, and is often equated with a dystopian future of machine rule. However now that AGI is actually beginning to graduate from science fiction to science fact, it is worth remembering that there is more to human intelligence than Logical Reasoning and Intuitive Deep Pattern Recognition. To be human is to be creative and we humans are capable not only of seeing and recognizing complex patterns of information, but also being able to “Design and Create” them. The brain is a biological tool designed, by millions of years of evolution, to compress “data” into “information”, and subsequently integrate this information into an intuitive map of the external world. Intuition therefore is in reality a totally natural but subconscious process of compression and integration; a subconscious mental process that tries to figure out what is real and how these real things fit together. But there is a side-effect to this mental integration. The side effect of trying to figure out how things fit together, is the potential awareness of “how things could fit together”. And so the subconscious process of information integration not only drives intuition, it also drives “imagination”; and consequently deep neural integration offers not only the potential to see hidden patterns of information, but also to “imagine the unseen”…. Neural integration drives imagination. It is in this compression and integration of information that “thoughts” begin to emerge; and imagination is simply a conscious process of focusing on these subconsciously generated thoughts. Our internal thoughts are like our own personal “internal data”, and when we focus on our thoughts we are effectively trying to extract information from our personal data. But the question arises, “How do we go about evaluating what information can be extracted from internally generated thoughts without any form of external feedback?”…. Over the last few million years, evolution has developed an internal feedback mechanism to evaluate internal thoughts. Feelings are evolution’s feedback mechanism of choice. Feelings and Emotional Intelligence are our internal mechanism for determining the “value” of thoughts and intuitions. Traditionally our modern society has placed great store in the value of human reasoning, and has reserved merely a degree of curiosity in the value of human feelings and intuition. However history has shown us that intuition has often been the seed of human insight, and many of our greatest leaps in understanding have been the result of such subconscious moments of inspiration. To be human is to be creative; and deep creativity is nearly always a combination of both emotional intelligence and a diversity of ideas. We have long known that anything repetitive or rule-based can essentially be carried out by a machine. The arrival of “computing” machines prompted the concept of the computer database, which ultimately led to the concept of expert machine systems. As the field of artificial intuition systems develops further we will increasingly find that machines will able to exhibit emergent expertise and resultant creativity when it comes to problem solving. But creativity is obviously not only limited to intuitive problem solving. True creativity drives the imagination, and deep imagination is (nearly always) the interplay of a diversity of ideas and some degree of emotional intelligence. The future of work is likely to be less about reasoning and more about creativity. And a future that involves artificial intelligence is less likely to be about machine rule and more likely to be about “machine assistance”; about machines capable of creative suggestion. We already know that the future of work will likely see the rise of artificial intelligence and the demise of many boring factory and office jobs. So what is going to be left for us to do?